This dream was born under the Ghanaian sun. Years ago, when Tacitus Bailey-Yabani and Jessica Bailey-Yabani were living in Tacitus’ home country of Ghana, they fell in love with the idea of opening their own food truck. It was an idea born from a love of food, of course, but it was more than that. It was about food breaking down barriers, sparking conversation, connecting people. It was about the way food builds community, the way it can get us all to slow down and remember to engage with this world: to leave our phones behind and look people in the eye and listen to their stories. And so, the two began to make plans. Inspired by the fresh food that surrounded them—a world of plantains and yams and avocados and fish—they began to dream of the menus they’d serve. 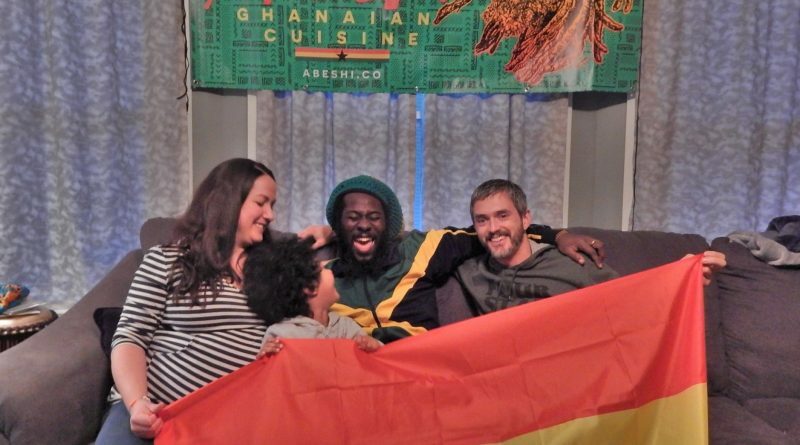 Then, five years ago, the couple, who met at a music festival in Ghana, left the West African country and traveled 5,000 miles to Jessica Bailey-Yabani’s hometown of Muskegon. Here, they’d begin a new life together, but the dream remained: the plan, they said, was to open a food truck in the next five years. “I feel proud—we’ve come a long way; we planned this a long time ago,” said Tacitus Bailey-Yabani, who, since arriving in Muskegon in 2014, has sewn himself into the fabric of the city. The year he moved here, he opened his business, Abeshi (which means “I’m here” in Ga, his mother’s native language that’s spoken in and around Ghana’s capital, Accra), at the Muskegon Farmers Market and went on to launch an Abeshi chalet at the Western Market in downtown Muskegon. There, he sold his own artwork, including the photography that propelled him to fame in his home country, and goods from other Ghanaian artists. Tacitus Bailey-Yabani, Jessica Bailey-Yabani, and William Jeannot receive a check for $5,000 after winning the 5×5 night last May. Last year, he launched Abeshi Ghanaian Cuisine, and he began serving West African food at the Western Market and offering a food delivery service. 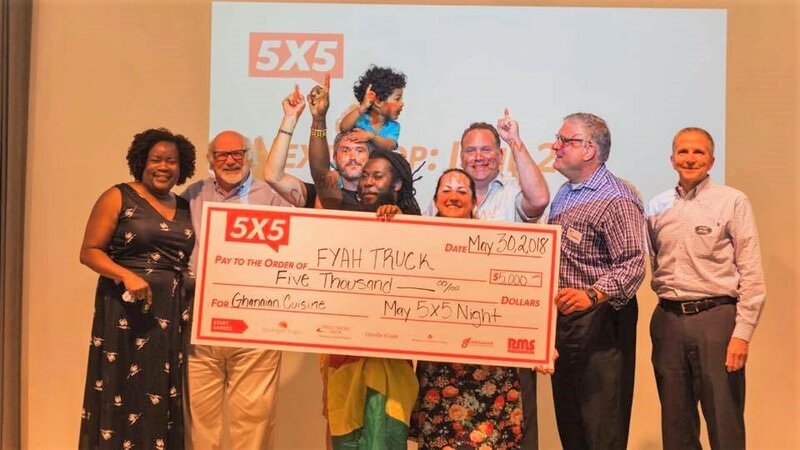 In May, the dream to open a food truck began to become a reality when Abeshi won $5,000 at the Muskegon 5×5 night, a business competition that aims to provide funding for local entrepreneurs. “The 5×5 night gave us a lot of clout going into searching for funding,” said Jeannot. The Bailey-Yabanis and Jeannot have now secured funding through Northern Initiatives, a nonprofit community development financial institution that makes loans to underserved entrepreneurs. This funding will allow them to soon purchase a food truck, which they plan to begin operating this spring or summer. The truck will offer Ghanaian, and other African, dishes in spots throughout the city, including downtown and the Third Street corridor. In other words, the Abeshi Fyah food truck is about what Tacitus Bailey-Yabani has been doing throughout his entire life: connecting people, creating community, breaking down the barriers that people both intentionally and unintentionally create. The food truck, those behind Abeshi hope, will be a way for people to try something they may have never had before, to meet people they have yet to know, to learn about cultures other than their own. “It’s an opportunity to bring more diversity downtown and to link communities,” Jessica Bailey-Yabani said. The food truck too will significantly expand culinary options not only in Muskegon but West Michigan as a whole. The venue will be the only African food in Muskegon—and the only Ghanaian restaurant in West Michigan. As for the food itself, much of it is inspired by Victoria Merley-Bekoe, Tacitus Bailey-Yabani’s grandmother, who taught him how to cook when he was growing up in Ghana. “Grandma taught me a whole lot; she taught me when someone teaches you something, you depend on what the person teaches you, but you also add to it so it becomes fusion,” he said. It’s these ideas—a love of fresh food, embracing taking the time out to cook—that the Bailey-Yabanis and Jeannot know will meld well with Muskegon. After all, this is a land of family farms, of restaurants that embraced farm-to-table culture long before there was a phrase for that, of people slowing down and enjoying the world around them. 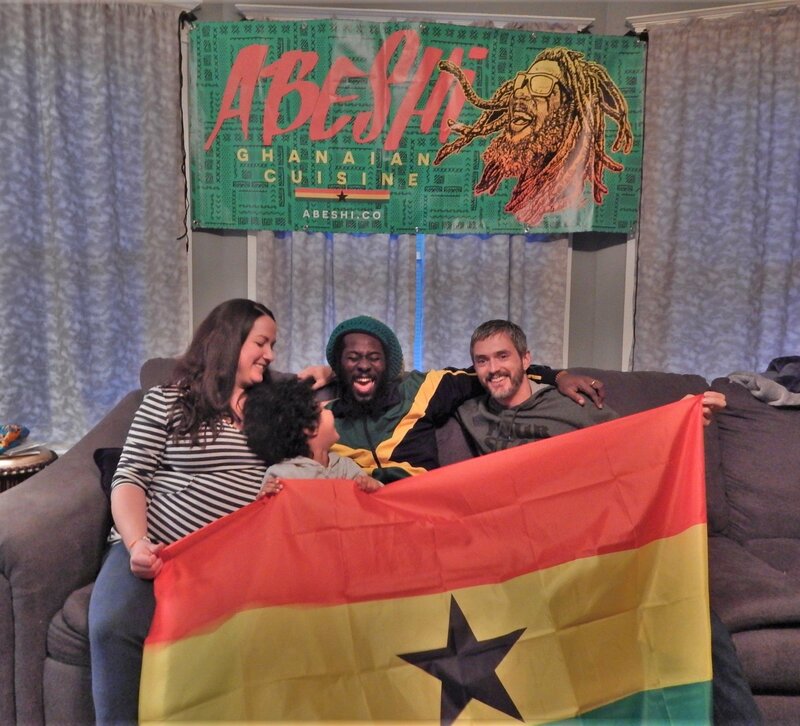 To follow Abeshi Ghanaian Cuisine, including announcements about the grand opening of their food truck, follow them on Facebook and Instagram.